I’m sure you’ve heard about a runner’s high, but ‘tis the season to talk about the “giver’s high.” Seems there is a biological reason we feel good after doing good. University of Oregon researchers conducted MRI scans on volunteers after they were handed $100 and then given the opportunity to donate some of it. The pleasure center of the brain was activated not just when the study subjects received the money but also when they gave it away! 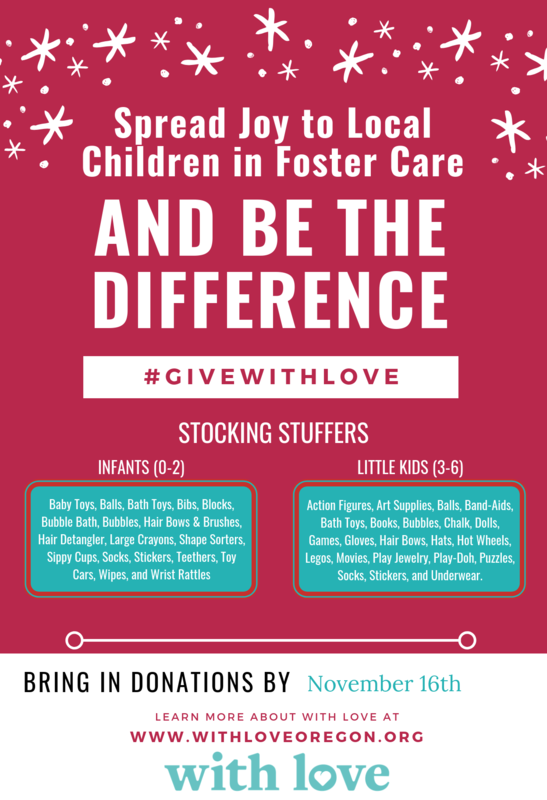 So if you are looking for ways to get a giver’s high this holiday season, here are some ideas where you can make an impact on our local community. Pillowcase Project. The City of Lake Oswego stepped in with a new project when word came down that the Fill a Stocking, Fill a Heart stocking program would not be operating. Pick up a handmade pillowcase sewn by City staff volunteers at City Hall, 380 A Avenue or the Adult Community Center, 505 G Avenue and fill with needed items for homeless families such as toiletries, socks, gloves, toys and games. Return to City Hall by Friday, December 14. With Love. This non-profit’s mission is to support foster families by providing safe, clean and quality clothing and supplies for children ages 0-6. Their Season of Giving includes a Stocking Stuffer Drive with a deadline of November 16. Items needed include: baby toys, balls, bath toys, bibs, wrist rattles, action figures, art supplies, dolls, games, and play jewelry. Check here for a complete list. Donations must be dropped off at the warehouse by November 16. 8178 SW Durham Road, Tigard. Hours: Tuesday evenings from 7:00 p.m. to 8:30 p.m. and Wednesday/Friday 11:00 a.m. to 1:00 p.m. If you’re collecting after the 16th, check here for ongoing needs. You can drop smaller items at the River West Church in the With Love bin located in the lobby: 2000 Country Club Road. Hours: Tuesday-Friday 9:00 a.m. to 5:00 p.m.
Tualatin School House Pantry. This Oregon Food Bank affiliate serves 510 families each month living in Tualatin, Durham, Lake Oswego, West Linn, and Wilsonville. Cash donations are welcome to buy essentials and if you donate online, you can designate what you want purchased with your dollars. Canned food donations are also welcome and can be dropped off at bins located at the Lake Oswego Public Library, 706 Fourth Street. Volunteers are also needed in the food pantry as well as delivering and picking up donations. 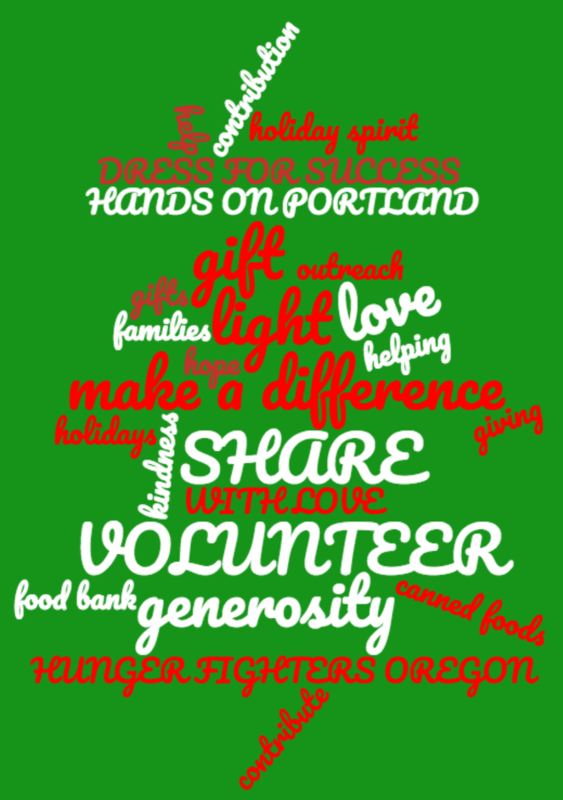 If you would like to volunteer, call the pantry at 503-783-0721 and leave a message for the Volunteer Coordinator or send an email to tracy@schoolhousepantry.org . Lake Oswego Toy Drive. Starting Thanksgiving week, you can drop off new, unwrapped toys to the Lake Oswego Fire Department Main Station (300 B Avenue). Donations will go to the Elks Club who will distribute them to local families in need. Please drop off toys by December 14. 503.635.0275. Hunger Fighters Oregon. Three years ago when students at Lake Oswego Junior High realized that food insecurity is an issue even for Lake Oswego families, they started a club to address it. Today this official nonprofit distributes food from a pantry located at Lakeridge Junior High School, 4700 Jean Road. Donations are always welcome during business hours every Saturday from 1:00 p.m. to 3:00 p.m. Current needs include pasta sauce, white/brown rice, canned chicken, snack foods, paper towels, toilet paper, jam, cooking oils, baking items, pasta (not spaghetti). Cash is always welcome too which you can donate in person or online. A gift of $28 feeds a family of four for a week. Volunteer help is also needed as a shopping assistant helping clients select their items and/or a gleaner, picking up donations from grocers and restaurants in the area. Contact Terri Childress at childress.hfo@gmail.com. HandsOn Portland. Check their calendar for ongoing as well as one-time volunteer opportunities. Many occur year-round such as serving at Potluck in the Park in Portland or delivering books to the Children’s Book Bank. But there are holiday-related events too such as the Holiday Cheer Gift Bag assembly (December 1 from 9:30 a.m. to 12:30 p.m.) and distribution (December 2-24) to isolated older adults in the Portland metro area. Canned food drives at local high schools. Both Lake Oswego and Lakeridge High Schools will be sponsoring canned food drives during the holidays. Lake Oswego High School’s is scheduled November 5-16 with all cans and cash donations going to Hunger Fighters Oregon. Lakeridge had not set a date as of press time so call for more information. You can drop donations off at the high school main office, or if you know a student, send your cans in with him or her. Lakeridge: 1235 Overlook Drive, 503.534.2319; Lake Oswego High School: 2501 Country Club Road, 503.534.2313. Lake Oswego Lions Club Coats, Blankets and Gloves Drive. Drop off lightly used, clean items at the south entrance of City Hall, 380 A Avenue through the end of January. Hope Sparrow Services will distribute these items throughout the winter to families in need in our community. This entry was posted in Holidays in Lake Oswego and tagged donating in Lake Oswego, holiday giving, Lake Oswego Oregon, season of giving, season of sharing. Bookmark the permalink.